No one can deny that they wish they can start leading a healthy life style that includes a good diet and an even better workout routine that guarantees both; being fit and having fun at the same time. This is where stand up paddle boarding can proudly step in as a friendly water sport that’ll help you do a full body workout while enjoying the water and whatever that is around you. The thing about this sport is that there are many brands out there competing to make affordable inflatable boards that offer functionality, practicality and uncompromised performance. 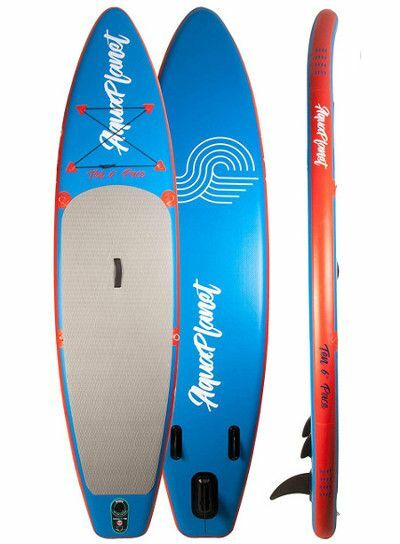 This is the case with our Aquaplanet 10’6″ Pace iSUP; a versatile board that you’ll get to know closely via this review in hope that it’ll be what you’re here looking for. The Aquaplanet Pace iSUP leans more towards being a beginners’ iSUP with pretty standard dimensions that we personally tend to find quite universal. In other words; the Pace’s measurements make it a multi-functional board that can do a nice job while trying different water activities. Now, let’s not drag this any longer; the Pace is 10 feet and 6 inches long, 30 inches wide and 6 inches thick. That being said, we’ll assume that you could tell why we said the Pace is better designed for entry level paddlers; it’s wide enough to ensure a good deal of balance for someone who’s trying to stand tall on a floating board for the first time. Also, thickness is something that determines any board’s value. A good board is nothing less than 6 inches and that’s for a reason. The thicker the board the harder it’ll be to make it capsize or submerge under water. Not only that, with this thickness, the Pace can hold up to 220 lbs and that’s a fully grown adult plus a furry friend or extra cargo. This little piece of information in addition to the board’s design; the pointy nose and slim deck, are what helped us see that not only a beginner can make use of the AquaPlanet Pace but also a first-time paddler who’s seeking a little more speed and control. Aquaplanet knows exactly what they need to do to make iSUP that’s up to all the standards know to this industry. Thus, the Pace is a really light weight board that’s so easy to handle in terms of packing and transportation. The material used to make the Pace is the durable and heavy duty PVC material that reduces the possibility of your board getting damaged. It’s flexible when the board is not inflated allowing you an extremely easy packing process. However, once fully inflated, the Pace is as hard as rock. In addition to that, the drop stitch core is a main quality of any durable inflatable SUP; it makes the board a lot stiffer and firmer when it reaches maximum air pressure capacity as it makes sure the board preserves its shape for years of regular use. The Pace is also designed with anti-flex bands on the rails to prevent unwanted flex when the board is in the water. This way, the board maintains a rigid stance that offers better and smoother control. The Aquaplanet Pace got everything an iSUP needs to be 100% functional and that’s what everyone is looking for in an iSUP. The first thing you may notice is the diamond grooved traction pad covering more than half the board’s back. It’s thick, soft and perfectly glued to the board adding to its stiffness. On the pad’s sides; you’ll find 4 stainless steel D-rings that are put there specifically for anyone who’s interested in kayak mode paddling. Another 4 D-rings are on the Pace’s front deck offering you a storage area with a bungee cord to secure any of your items. 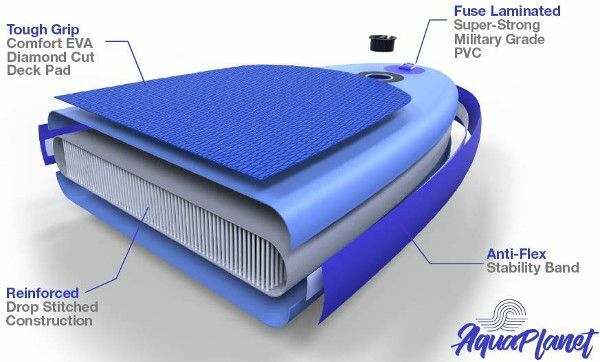 There is a central carry handle which is only expected to be there since inflatable standup paddle boards are all about practicality. This handle will allow you to easily carry the inflated board using one hand while your other hand is free to grab anything else. Finally, this iSUP board is featured with a nice navigation system that consists of 3 fins; one of which is large and removable while the other two are smaller and fixed. These fins are really useful and impactful when it comes to long distance touring or maneuvers making the paddling process quite fun and effortless. The Aquaplanet Pace iSUP is definitely a stable board that proved to be a good choice for paddlers with different skill levels. The pointy nose is always a sign that the board cuts sharper through water. It’s also easier to control. Also, the trio-fin navigation system makes the board a lot more versatile with the ability to take on choppy water to make it possible for a mediocre level paddler to enjoy some small waves in the ocean. Yet, as a beginner you’ll easily find your way towards standing tall on the Pace because it designed to support weight and wobbly feet just right until you get a grasp of the whole thing. Concerning this board’s tempo, the Pace will not disappoint you; a comfortable paddling pace will take you far enough to feel like an adventure without getting exhausted and end up wanting to go back to the shore too soon. 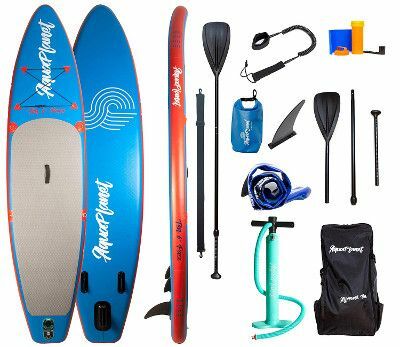 Aquaplanet Pace iSUP’s package was our greatest surprise; this board is definitely a good deal given what it has to offer in terms of performance and what you’re getting along with it once you order it. A really nice backpack where you can fit the whole thing. A dual action hand pump. A little surf pack to keep your personal items safe and protected. An adjustable carry strap that can be used to carry the inflated board. And a 3-piece adjustable paddle. This package lacks literally nothing, and thus, there is nothing stopping us from calling it a perfect package. Number one Pro is the Pace’s awesome and complete package for an unbeatable price. The Pace is a very versatile board that delivers a nice performance in different water conditions. It’s stable for beginners, and maneuverable for higher levels. Kayak mode is available on the pace. There isn’t any obvious issue to complain about here, however, a future update is always an option in case anything worth mentioning happened.